Quilts correspond to sheet and mattress sizing conventions; single, double, queen and king. Unlike sheets, it is possible to buy a bigger quilt for blanket hogs; quilts are wider and longer than most mattresses. Most quilts are white and hemmed with careful stitching. Quilt covers have come a long way from the creamy colours and gaudy prints of traditional coverlets. Reds, greens, blues and yellows, silks, satin, matte fabrics and lace embellishments; the design of your quilt cover can make your décor plan pop. Go bright and bold for maximum impact, integrating stripes with block colours or rich fabrics. Too chaotic for your private paradise? Invest in calming tones and sweeping patterns for a more subdued feel. It is very unlikely you will have one quilt for every season, unless you are lucky enough to live in a moderate climate. Quilt warmth is calculated by GSM (density), loft (height) and quilt filling. GSM or Grams per Square Metre allows you to choose the right thickness for your comfort. Fair weather quilts sit between 150 to 350 GSM. Winter warrants a quilt above 500 GSM, or 700 GSM, if you’re leaning toward a feathered quilt. Loft is a fast way to determine how thick and warm a quilt is without scanning tags for GSM numbers. Light Loft is equal to 300 GSM or 2 standard blankets. High Loft is equal to 450 GSM or 3 standard blankets. Super Loft is equal to 500 GSM or 5 standard blankets. Loft is simply how high the quilt rises. A quality quilt retains its height for over 5 years; cheaper quilts can last up to 2 years and feathered quilts may have a longer life-span of up to 10, provided you care for it between seasons. When loft begins to fail, the quilt loses the ability to insulate and regulate body heat, transforming a relaxing night into a restless nightmare. Choosing your quilt can come down to your preferred filling. When selecting a quilt, consider your sleeping habits and general lifestyle. Do you suffer from allergies? Is your bedroom naturally cool or warm? Do you already use an electric blanket? Asking these questions can help determine which filling is right for you. Microfibre quilts have been designed to insulate like a feathered quilt without the allergic reaction. They come in a number of different weights and lofts. Wool quilts are great all-rounders, warming in winter and moisture efficient in summer so you don’t wake hot and sticky. 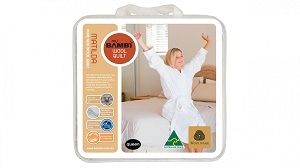 A natural fibre and an efficient insulator, wool quilts are becoming more popular with environmentally driven buyers. Pure feather quilts can be very heavy, although a combination of down and feather can significantly reduce the overall weight. Very much a winter quilt, the feathers and down trap body heat and create a toasty, comfortable winter sleep. Cotton is a pristine natural fibre ideal for those who have trouble with allergies. Do you live in a warm climate? Cotton quilts are best suited to households that have trouble telling the seasons apart or those who experience long summers and mild shoulder seasons.